Promotional Photography courtesy of Le Chop on Facebook and Tracey Brooke Public Relations. Let’s be honest, February is not the most exciting month. Some of us (ok, most of us) are still recovering from post-holiday spending, and the weather generally doesn’t make it feel like Spring is actually next month. It’s easy to resort to a fail-proof tried and true method: hibernate until the snow is all gone. For those of us starting to get cabin fever, however, February offers up a great (and affordable!) 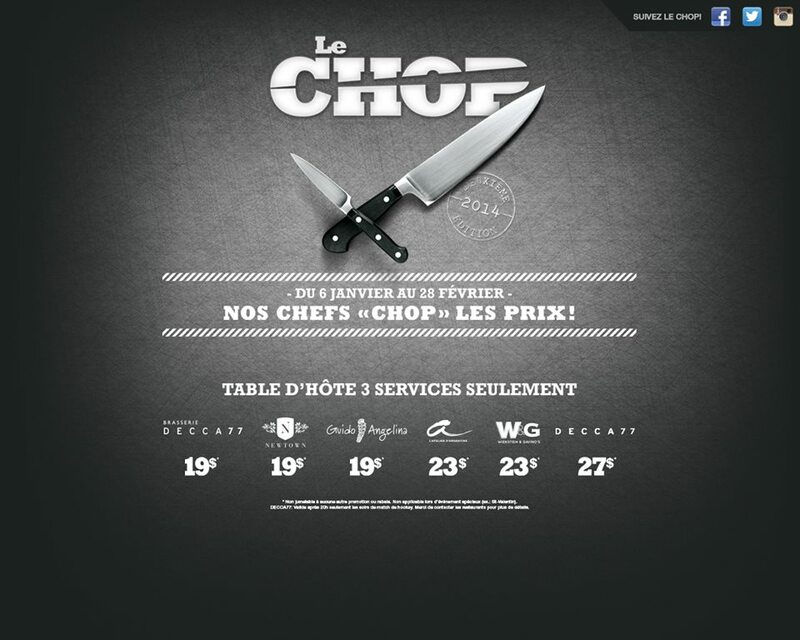 culinary event: Le Chop Montreal. Atelier Argentine, Le Newtown, Brasserie Decca 77, Decca 77, Guido & Angelina, and Wienstein and Gavinos are all presenting a special three-course table d’hôte, starting from 19$ to 27$. The Nuda-team had the pleasure of dining at Atelier Argentine and we were mightily impressed. The food was not only delectable, but our server was extremely attentive and timed everything just right. To start, our server brought us not only some nice warm buns (with soft butter- always a plus) but little bready-cheesy-balls. They looked like little tatter tots and tasted liked heaven. Any bread-cheese combinations is always a winner in our books. We ordered the arugula basil salad as well as the coconut shrimp soup to start. Both were delicious, but the soup was more on the spicy side, and less on the coconut-y side. For the main, we both had the grilled salmon steak. The fish was cooked to perfection: lightly charred on the outside and slightly pink on the inside. And for desert, we tried the chocolate cake, and apple & cinnamon crumble. Hungry yet? What struck me as really special though, is a discreet culinary option located right next to the kitchen. There sits a wooden picnic table with a map of Buenos Aires drawn on it. For 95$ per person, the owner explained to me, the chef will sit with you and bring you dishes from different regions of the country, complete with wine pairings. For anyone looking for an up-close personal experience with the why and how of the restaurant’s approach to its cuisine, a date with the chef will no doubt hit the spot! 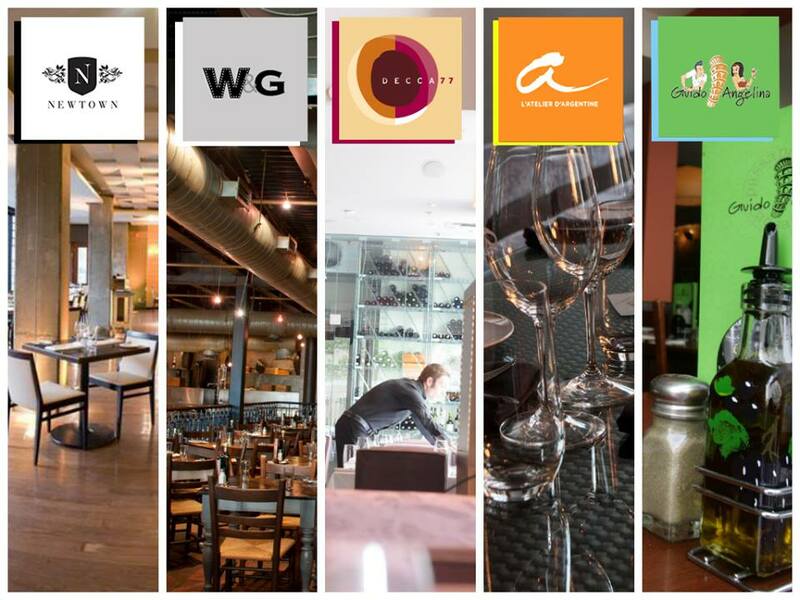 Check out Le Chop Montreal’s facebook page for the participating restaurants’ menus: https://www.facebook.com/LeChopMTL.